Every day it seems another natural disaster could bring about the apocalypse. Volcanoes. Earthquakes. Hurricanes. Sometimes that list includes asteroids. But despite exaggerated headlines from the usual suspects, there’s no need to worry about the latest nearby asteroid approach. (3200) Phaethon is a rock five kilometers in diameter with an oblong orbit that intersects Earth. It’s scheduled to make a nearby approach on December 16th. You’ll probably hear more fear-mongering shouting about it until then, but it’s not a rock you should worry about during your lifetime. Scientists first discovered (3200) Phaethon in 1983, according to a NASA-Jet Propulsion Laboratory data sheet. Its eccentric crosses our own planet’s orbit, putting humanity in a pretty precarious place. It’s been classified as a “Potentially Hazardous Asteroid” for that reason. But the name is a tad misleading. Holman didn’t speak directly to (3200) Phaethon, but discussed that scientists study these things closely. The community tracks and models the orbits of any potentially dangerous rocks, like they did for 99942 Apophis which briefly caused a scare about a decade ago. Scientists at agencies designed to worry about these things such as NASA would tell you if (3200) Phaethon was truly a threat. The rock will pass a little less than 6,500,000 miles from the Earth on December 16th, around a fifth of the distance from Earth to Mars at its closest. 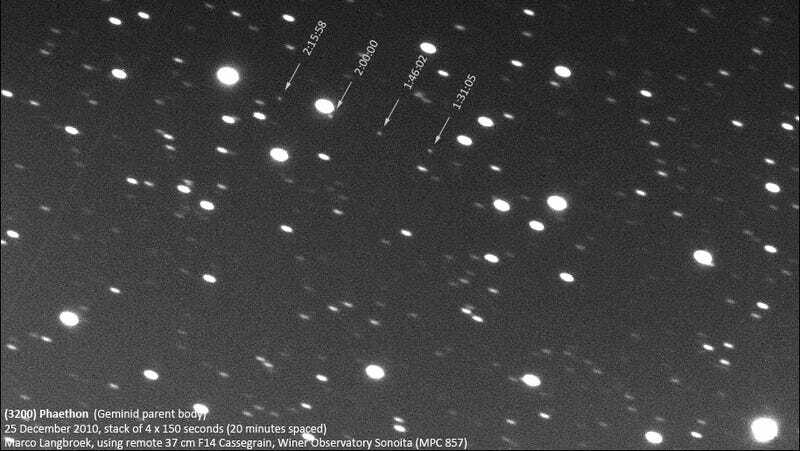 Mars is very far away—but you still might be able to observe the asteroid with a telescope. The next time it will come any closer is 2093 when it will pass around 1.85 million miles away—still seven times further than the moon. You will most likely be dead by then. (3200) Phaethon is still neat and strange. It produces a meteor shower here on Earth called the Geminids, but normally it’s comets, not asteroids, that cause these events. There are a few theories as to why that might be, but it’s still a mystery. Anyway, take a breather and enjoy the holiday season. There is no need to worry about an asteroid. Update 12:15pm: We spoke to Gareth Williams, astrophysicist from the Harvard Smithsonian Center for Astrophysics, for a little more detail. Determining whether a large meteor will strike is never an easy yes-or-no answer, he said. As soon as an asteroid is discovered, there’s a large, uncertain region where scientists think it will travel, a region that may or may not include Earth. After subsequent observations, that region will become smaller, and an impact is ruled out once Earth is outside of that region. So we might not know a lot, but in this case, we know this meteor is not a big deal.